The newest country to discover Kavanah Kards is Brazil. Shows how Hashem can do anything! Someone there found us on the internet. KAVANAH KARDS GO TO SWITZERLAND! Baruch Hashem Kavanah Kards are on the way to our new Ambassador in Switzerland. A happy Kavanah Kard user wants to spread them there! Yasher Koach! 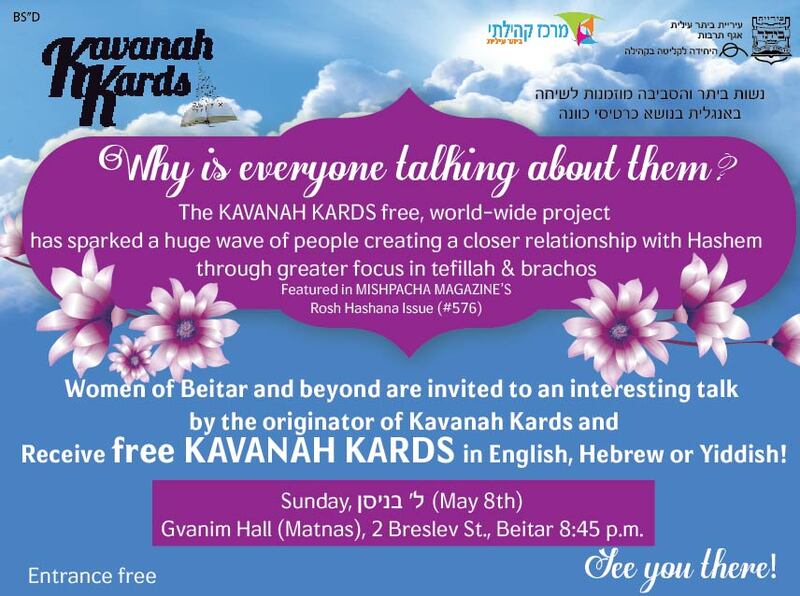 Kudos to the Nshei of Beitar Israel for sponsoring our second presentation--this time on the Mindful Mitzvahs Campaign! Interestingly, an increasing proportion of those who visit are from Russia, even though we don't yet have cards in Russian, although it would be wonderful, surely. In fact, at last count, there were 39 Russian referring websites bringing people to us! This is surely a great mitzvah opportunity for everyone who wants to share in the zechus of bringing people closer to Hashem. Would you consider donating to support Kavanah Kards, to help with postage or printing or to translate them into other needed languages like Russian, Spanish or French? Please contact us. YIDDISH KAVANAH KARDS GO TO AUSTRALIA! Baruch Hashem Yiddish Kavanah Kards are in Austria in a school there. BE"H hopefully they will be very popular!